He's been pushing this negative schtick for anything related to Atlanta for years now, and not just Downtown. I'm actually surprised he hasn't left yet. Yep. Background noise with nothing constructive to say. I do think it would help if there were a shopping district downtown, although Atlantic Station probably pre-empted that possibility. I think the south downtown and Underground redevelopments will fill that need. well, there's not too many places that stay open late night downtown. you've got mama mia's, two waffle house locations, landmark diner, and yumm teriyaki and that's about it. if you're in town late and aren't drinking there are only a handful of options. it beats everywhere else in the metro area for sure but especially when it's cold the lack of places to just warm up is notable, and so is MARTA being closed before the bars even do. we need more public places downtown that are open late, but our city, state, and country seems to have a collective fear of the homeless that's led to a lot of stupid laws being passed that suffocate the street life and make the problem even worse (no street vending, "urban camping" ordinance, no single occupancy hotels, no temporary work without significant documentation, etc.). of all the places in the metro it seems like should be able to have one neighborhood, just one, that you can go to when you don't have anyplace else to go, warm up, and make some money in a legit way and contribute to society. instead, if you're broke, you have to beg or be willing to sell something illegal. people complain about being harassed... it's because we've cut off the bottom rungs of the economic ladder and have left a significant number of people out on the damn street with nothing to do and nowhere to go. this is a legitimate issue that needs to be addressed. look at downtown in the 50s and 60s, it was not like this, at least if you were white. but once it became illegal to discriminate based on race, we can't have a functioning downtown because apparently it's not safe anymore? i call BS. well, there's not too many places that stay open late night downtown. you've got mama mia's, two waffle house locations, landmark diner, and yumm teriyaki and that's about it. There are too few options, for sure, but to add to your list, there's Anatolia, open until 2 on weekends, Park Bar (til 1), Sidebar, (til 12), Der Biergarden (til 12). There's probably a bunch of stuff in Castleberry open fairly late. Assuming food service ends an hour before closing, that's still plenty of time to get something to eat after a typical sports game or concert. I love the United. Then the game is over, we exit the stadium, and realize there's absolutely nothing else to walk to and leave. Marietta St restaurants, Park Bar, Sidebar, Castleberry Hill? 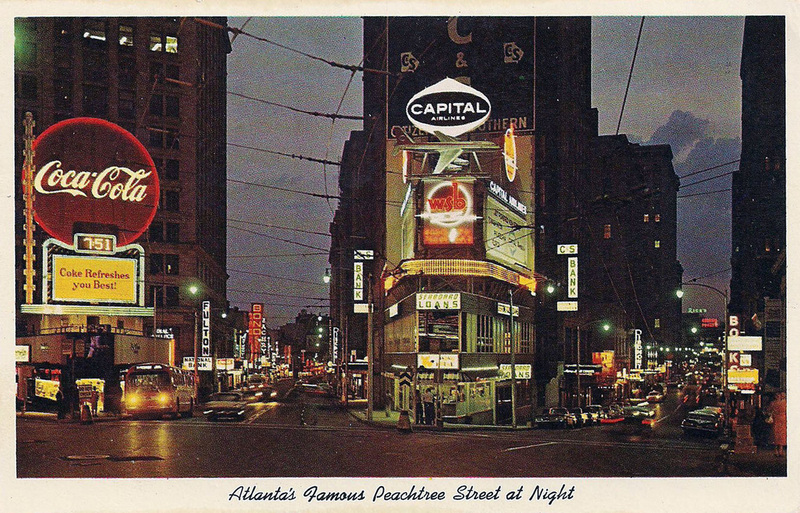 I don't think there were many late night eateries in downtown Atlanta in those days. Maybe the Blue Bird truck stop down on Pryor or the bus station. Folks generally didn't howl at the moon back then. sorry for the misinformation about atlanta being a 24/7 city, my dad was just a kid in the 50s/60s and most of his memories are from the 70s forward, so anytime i talk about that time period it's me making a stab in the dark from whatever info i can glean from books, photos, newspaper articles, city documents, documentaries, and the rare conversation i have with a long time atlanta native. you should do a tour of atlanta or something, or maybe youtube videos with photos? there aren't many people in atlanta today who were around during that time period and honestly i would love to hear more about what it was like. just everyday stuff like what the neighborhoods were like, where to get a bite to eat, what people carried with them in their pockets, what people did to make money, how the smog was, how it was driving to another city; stuff like that isn't documented and maintained very well.